Please Note: Unfortunately, our hotel is no longer able to accommodate pets. Pets found in the hotel will result in a $500.00 penalty fee. Thanks to the promise of make-your-own waffles and hot coffee every morning, waking up is a little bit easier at the Country Inn & Suites, Forest Lake. 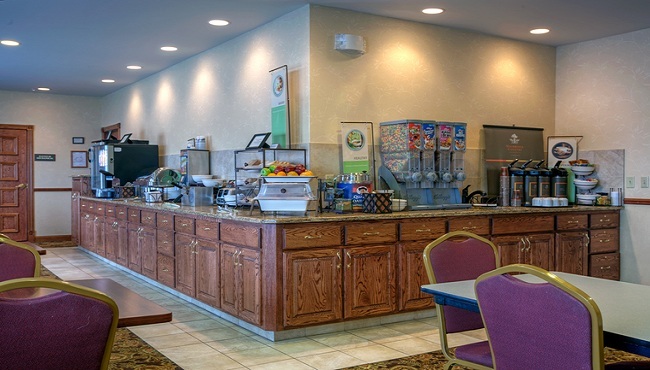 Stop by our dining room for morning favorites like pastries, muffins, cereal and juice. When you're ready for a mouthwatering lunch or dinner, head to Forest Lake restaurants, such as Famous Dave’s and Stella’s on 97.